With the advent of pressure washers, it is now possible to clean household materials previously had to be left only for the professionals. Today, people use their pressure washers to clean certain types of tools and equipment, fencing, and the outside of their home. 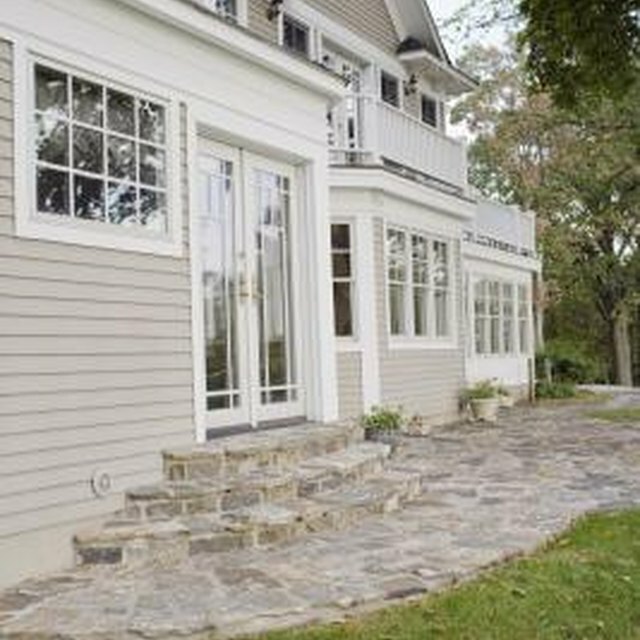 Whether home's siding is make from stone, brick, or aluminum, it is possible to use a pressure washer on the surface. In fact, using such a device is considered by many to be the best way to clean aluminum siding. Purchase or [rent a pressure washer](https://homesteady.com/how-172493-rent-pressure-washer.html) to clean the aluminum siding. Make sure that the system is strong enough to do the job but not too strong. To clean aluminum siding properly, the pressure washer needs to be capable of sustain a high degree of temperature -- at least 250 degrees -- and blast water at between 1,500 and 2,000 pounds of pressure. Also make certain that you have the electrical equipment necessary to hook up the machine. This may include a long heavy-duty extension cord and/or a generator. Secure loose siding, window coverings, house trim and guttering. If there is, these must be secured before proceeding to the next step. Otherwise they could be broken or damaged during pressure washing. Remove anything that is temporarily mounted on the siding if it is likely to move or work loose during cleaning. This could include, but would not be limited to, address numbers, light fixtures (especially glass), mailboxes, wreaths and/or other décor. Cover flowerbeds and bushes that might be impacted by the washing. Use medium weight tarps that can withstand the water pressure but are not heavy enough to damage the plants. Move outdoor furnishings away from the house. Store on a patio or in the garage until the job is complete. Bleach the siding if that is needed before pressure washing begins. Mix about one cup of bleach to every 60 ounces of water and spray onto the siding with a spray mister like that used in home extermination. Scrub any areas that are unusually dirty or stained with a slightly abrasive cleaning sponge. Rinse bleached siding clean with a hose and sprayer if pressure washing is not going to take place immediately. Hook up the pressure washer to an outdoor water system. If the machine requires detergent, fill the dispenser with product that is approved by the machine manufacturer. Run a test on the pressure washer before beginning the process. Decide whether to work from back to front or front to back. Also determine whether to move from right to left or left to right. Any of those options are acceptable. Making a decision with how to approach the pressure washing, however, will help make certain that the entire home is cleaned. Climb up on a ladder or get on top of the roof in order to handle pressure washing toward the top of the home. It is important that the washer spray down the siding rather than straight on or in an upward fashion. Spray gutters, soffits, and downpours holding the wand at about a 45-degree angle rather than straight on. Work from one side to the other, adjusting the power as necessary in order to get good cleaning action. Move to the middle section of the home, spraying either from the ground or on a ladder, depending upon the height of the house being cleaned and appropriate safety factors. Complete the washing on the lowest level using the same techniques outlined in Steps 3 and 4 above. Rinse each section with a garden hose and mister if necessary in order to make certain that no dirt or debris remains left behind. Always follow the instructions for the specific machine being used. Bleach water can be strengthen to one and one-half cups for every 60 ounces if the siding is unusually dirty or is infected with mold or mildew. Choose a pressure washing machine that is only as strong as needed for the everyday jobs to be completed. Always use an even, steady pace. If using detergent, apply it on a lower pressure. Then rinse at a higher-pressure rate. Stronger or bigger isn't always the best option with regard to these machines. Something too strong may cause damage. Be careful not to hold the washer wand too close to the siding as it might crack or damage it. Work cautiously around windows. Never spray the system directly at the glass panes or push water into the window's sealed joints. Do not use the machine in any way that is prohibited by the equipment manufacturer. What Is a Safe Way to Kill Moss on a Roof?